Not too long ago, I talked about being blown away by Five Ghosts: The Haunting of Fabian Gray, a 5-part miniseries that proved so monumentally successful that Image Comics opted to upgrade the title into an ongoing series. And thus we now have Five Ghosts #6, which is tasked from transitioning Frank J Barbiere and Chris Mooneyham’s magnificently-realised world from something self-contained and finite into a more longform narrative. Of course, anybody who read The Haunting of Fabian Gray will be overjoyed to get more of the story, but there are questions about whether something originally intended to be 5 issues long has enough fuel in the tank to sustain an extended narrative. Thankfully, if Five Ghosts #6 is anything to go by, all signs point to that first arc being no flash in the pan. But one big question mark that immediately pops up is the realisation that Chris Mooneyham is not on art duties. If you recall my earlier review, you’ll remember I spent some time talking about how central Chris Mooneyham’s dynamic visual flair was to the success of the comic, with how he skillfully balanced this channelled essence of old-school pulp with a highly modern sensibility for pushing the boundaries of inventiveness on the page. After reading the first 5 issues of Five Ghosts, it was nigh-unthinkable to imagine anyone else drawing the book. And other Image comics like Saga and now Lazarus have popularised the notion of, “No fill-in artists here, the primary artist is worth the wait, so we’d rather take a break in between arcs rather than have anyone else drawing this comic.” So, Garry Brown – perhaps best known for his work on The Massive – comes in faced with something of an uphill battle. So it’s perhaps the best compliment I can give Garry Brown that by the third page of this story, I no longer missed Chris Mooneyham. The style is noticeably different from Mooneyham’s, yes. Mooneyham has more of a wild, energetic vibe that leaps off the page, whereas – save for the occasional flourish – Brown’s style is more rigid and structured, bringing more of a quiet confidence to his storytelling. But Mooneyham and Brown take different approaches to achieving the same commendable goal: transporting the reader back in time and making them feel like they’re being immersed in an old adventure tale from a bygone era. In particular, Brown’s understated style here is refined to read like an homage to Jim Aparo. While there was a broad range of pulp/pastiche reference in Mooneyham’s visuals, Brown’s aesthetic feels laser-focused into recreating the vibe of a 1970s Batman book, to the point where I half-expected Ra’s al Ghul to show up. And with Lauren Affe’s luscious colors, the tone all manages to feel consistent with what came before. Something else that remains consistent is this title’s ability to seamlessly transition from adventure to horror, as Brown shows an aptitude for some quite horrific creature designs, from the tentacled creature that spies on Fabian and old flame Hisano through their window to the Mistress of the rival clan they intend to strike: she is wearing what appears to be a dress made out of skin! Not that Brown skimps on the adventure side of things either. As the climax descends into a massive fight scene, Brown meticulously frames the choreography of the battle, making the whole sequence feel very hard-hitting. Frank J Barbiere continues to deliver the goods on the story front, too. I remarked how dense and packed with story content each individual chapter of the first arc was. Well, that is heightened even further with a tale that is completely self-contained, save for a few ominous references to a larger threat looming in the background. If you have held off on trying Five Ghosts – for shame! – I think this works as an accessible jumping-on point for new readers, right down to how Barbiere concisely re-establishes Fabian Gray’s unique powers. I think the real narrative triumph of this issue, however, is that it reaffirms that this is a story driven by character. With the breakneck pace of The Haunting of Fabian Gray, one would be forgiven for thinking this was an incredibly plot-driven book. But here, much of the trappings of the previously-established narrative are removed, and we are given Fabian Gray in a whole new setting, travelling to Japan to aid an old flame from his past. It establishes that Gray is a figure with a rich and storied history to draw from, and it’s his magnetic presence that’s going to carry us forward from arc to arc. 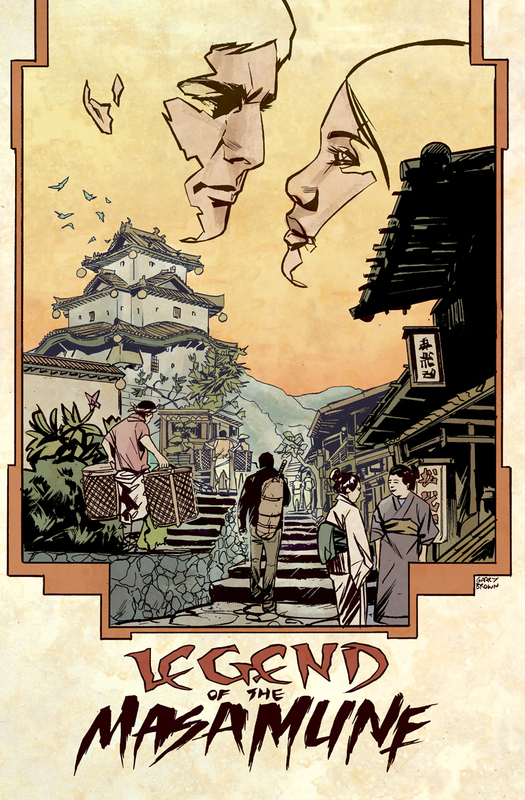 The first 5 issues of Five Ghosts were one of my comic joys of 2013. So I’m glad to see that the standard has been maintained through the comic’s transition from miniseries to ongoing. Barbiere continues to craft compelling, action-packed stories, anchored by one of the best new protagonists to emerge in any medium this year. And though I’m eager to see Chris Mooneyham return to the series, Garry Brown did a stellar job filling in, and I would be very keen to see him return for future guest spots. Synopsis: Fabian travels to Japan to aid an old ally in the search for a mythical weapon: the legendary sword known as MASAMUNE! 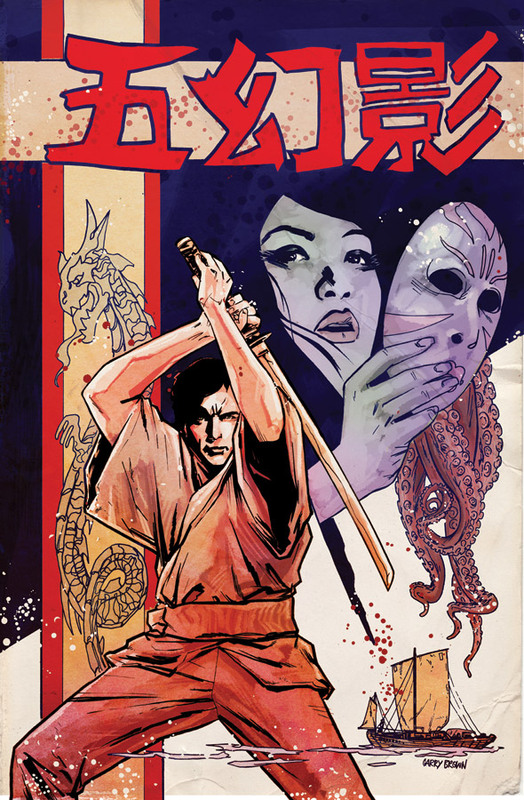 Five Ghosts #6 is available in all good comic shops now. « B&N Week 149: Do You Cause More Work For The Creative Team?